I wanted a modular Character Sheet that would allow me to use it for all the different characters that might be created. 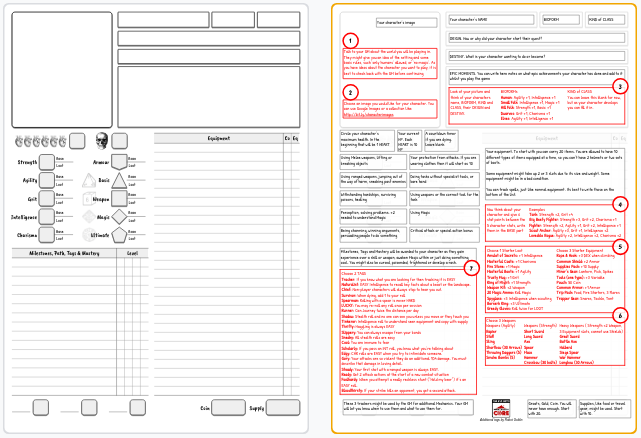 I also wanted everything on 1 sheet so that a new player can work through it and understand what was going on, even if they haven’t played a TTRPG before. 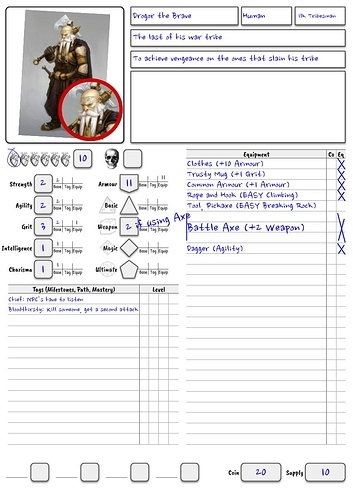 Sort of a Dungeon Masters Screen, but for players. I also play with players who’s English is not their native language, so I wanted to simplify the Stats a little (in language), without having to convert anything, And lastly I like a low magic setting, so Magic is learnt later in the game. Cool to see my milestone tags integrated! Hope your players like them. They are great. I just modified GORY slightly to make it a risky choice to do for higher level enemies, so it would statistically work more often on lower (and weaker) enemies. Gory: If you succeed a HARD Attempt on an attack then it is so violent that you do an extra 1D4 damage. You must describe that damage in loving detail.